With the buzz of Cloud Computing gaining momentum, the question of moving or not has become more important for the business leaders of any organization. 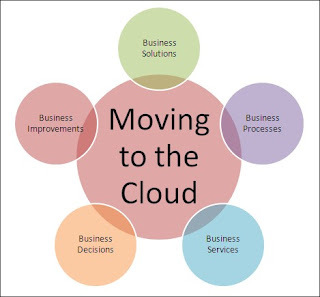 Migrating to the Cloud is supposed to be a technology decision because everybody looks at Cloud Computing more as pure technology advancement, but it is important to note that this decision is linked more to business needs such as ROI, performance, cost & time benefits and suitability to tasks. 4. Auditing internal processes and their performance improvement using the Cloud. As already mentioned, moving to the Cloud holds significant benefits to the corporate IT departments. The relationship and communication between the business units and IT department will change. Greater power will shift to business units from IT. Working in the Cloud means functions performed by corporate IT departments will shift from those who do to those who define and manage. Remember that Cloud Computing is a change in business models, and not JUST a new technology. Explore the business decisions, as this enables IT and business leaders to decide on which applications should move to the cloud. Great that you've mention switching to cloud services. I have switched, of course and I use secure data room at the moment for my corporate needs. Is Cloud Computing changing Project Management?